We love to travel and we usually plan out a fun week long fall trip. However, this year our children’s school fall break and my husband’s fall break (he is a teacher), fell on different weeks so we decided to just take a quick family weekend getaway. From Nashville, there are lots of great options for fun family weekend getaways. 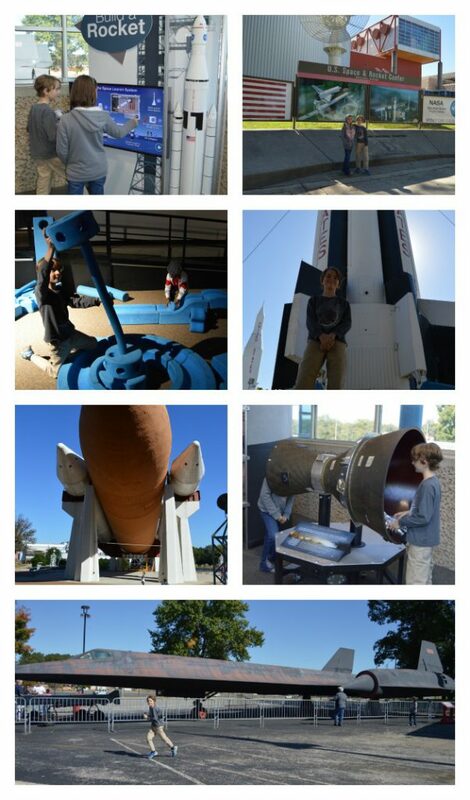 We have been meaning to bring our kids to the Space and Rocket Center in Huntsville, Alabama for a little while now. We decided it was the perfect opportunity since it is under two hours of drive time- just right for a family weekend getaway. Then because we were going to be in Alabama, we decided we would drive over to Birmingham to see our old college friends since that is just under 3 hours to get back to Nashville. We had a great family weekend getaway. Let me tell you all about it and share a few tips for planning your fun family weekend getaways! The “Joy of Travel” is all about seeing new sights, trying new food, learning new things, and slowing down to appreciate the beauty of things you see. Some people let themselves be intimidated by traveling with kids but I can tell you that we love to travel as a family. You just have to be prepared. Here are a few thing to consider when planning your next fun family weekend getaways. If you only have time for a weekend getaway, then plan a short road trip! Try to keep the drive time under 3 hours each way because you will want to spend most of your time having fun sightseeing, and enjoying the hotel’s amenities. Make sure to pack a few snacks and bring a be prepared with few road trip games to keep the kids entertained. Make sure you scope out the area you want to go to. Impromptu travel is way more fun when you are single but for family travel, it is important to have a detailed plan so that everything flows smoothly. You need to check attraction hours and prices so that you don’t show up to a closed attraction or pay twice as much as you were expecting. Don’t plan too many attractions into one day because you don’t want to feel hurried. 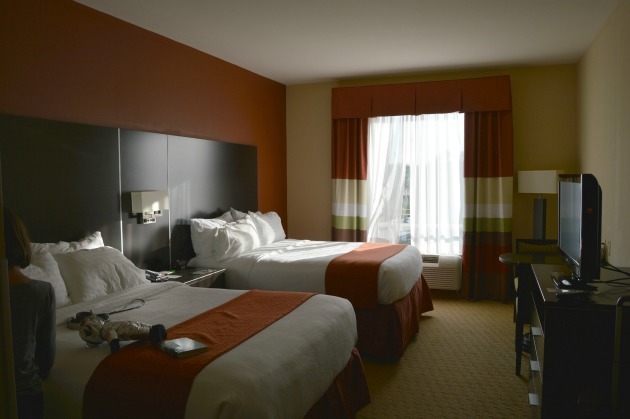 When it comes time to make hotel reservations, chose a hotel that has the amenities you want and that is conveniently located near the chosen attractions. I found the perfect Holiday Inn hotels near both attractions I planned to visit and they had the most important amenity to my kids- an indoor heated pool- that’s what makes it feel like a vacation to them! 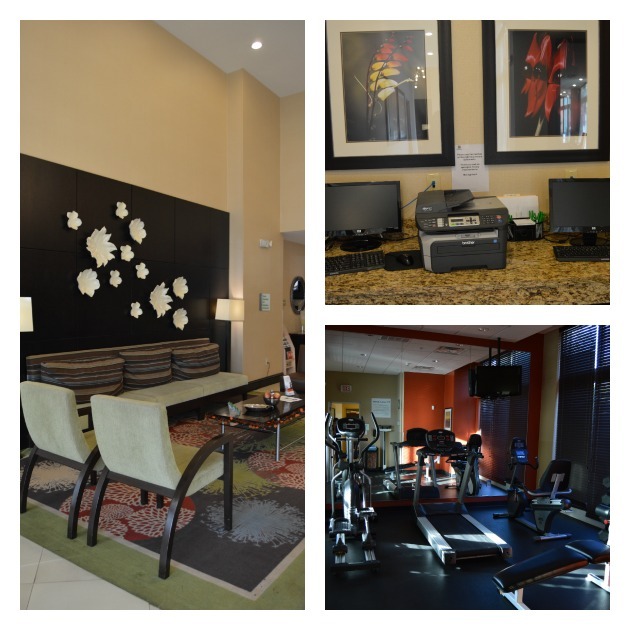 Holiday Inn hotels are great for family getaways because they have free high-speed internet access (great for my husband to access work while away) and family-friendly amenities like on-site restaurants, pools and exercise facilities. Plus, kids stay and eat free at Holiday Inn Hotels- sweet! The great thing is you are just going for a weekend so packing shouldn’t be too hard. Packing for the adults is usually not very challenging- a couple of outfits, jammies, a swimsuit, toiletries, cute shoes, and comfortable shoes. Packing for kids is all of that plus a few extra outfits for when they spill their drink, jackets for when they are cold, books to read, and stuffed animals to cuddle. If you are the kind of person that wants to be 110 % prepared, you may enjoy these 25 packing tips for traveling with kids. That is it. With these tips you are now ready to hit the road and enjoy fun family weekend getaways! Here is how our family weekend getaway shaped up. When the kids got off of school on Friday, I had everything packed and ready to go. We drove from Nashville to Hunstville in under 2 hours and checked into our hotel- Holiday Inn Huntsville- Research Park. It was very welcoming and inviting. We went out for Mexican at Rosie’s Mexican Cantina and I loved the atmosphere and the food was good. It was pretty late by the time we got back to the hotel so we just hit the sack after watching a bit of TV. The next morning we got up bright and early and enjoyed a great breakfast at Blue Plate Cafe. We tried their Saturday special for the table- biscuits with chocolate gravy- so good! My husband and I loved our Blue Plates and the kids loved their pancakes. Then we headed back over to our hotel, Holiday Inn Huntsville– Research Park, to enjoy some time at their fantastic pool. The pool is actually an indoor/outdoor pool joined by a swim through area! It was closed off because of the cool weather but so cool! The inside pool was heated and I mean it felt fantastic. There was also a hot tub for me to enjoy while the kids played. There were even pool toys. We had a great time at the pool and it was very memorable. I pulled them away from the pool so that we could go see the U.S. Space & Rocket Center. They have an absolutely huge gift shop area where you could spend huge amounts of time just looking at space books, space movies, space t-shirts, astronaut suits, space food, huge structures, and an interactive exhibit. We finally went inside though and there was so much to see and do. We bought tickets with an IMAX® movie included so we saw “Journey Into Space”. My daughter wants to be a rocket scientist so I consider the trip an investment in her education! They have rides, interactive exhibits and pieces of history that you can study. We had a fantastic time! Next, we drove on to Birmingham and checked into Holiday Inn Birmingham – Hoover. They make travel a more enjoyable experience because I like knowing what to expect and I always get really great friendly service. My kids like knowing they can hit the heated indoor pool and that is exactly what we did after we checked in! The lobby was really pretty and then there was a sports watching area, a workout area, a sitting area, a business area, and a restaurant. They had the coolest program going on at that Holiday Inn which I thought was a great idea and which my kids LOVED. You can borrow a fish for your room during your stay! That evening we headed out and met our friends at their house so I don’t have any huge report for the evening except that it is so much fun to see old friends again! Add that to your to do list for sometime soon. After a good night’s sleep we met our friend at Another Broken Egg for breakfast. It was delicious and I would share a photo but there were 6 kids at the table and two of them were under 3 so my attention may have been elsewhere! Then we went to the Birmingham Zoo and it is really awesome! 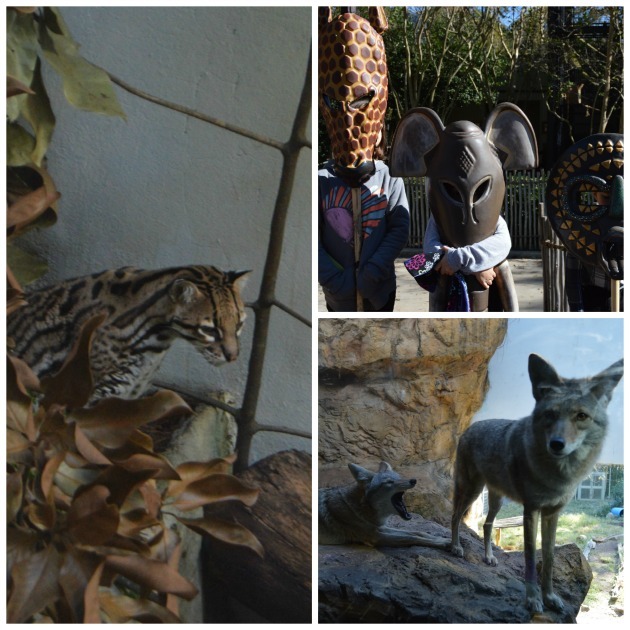 They had well designed exhibits so you could get amazing views of the animals and they had an amazing cats section. We had lot of fun and we enjoyed the Halloween decorations too! 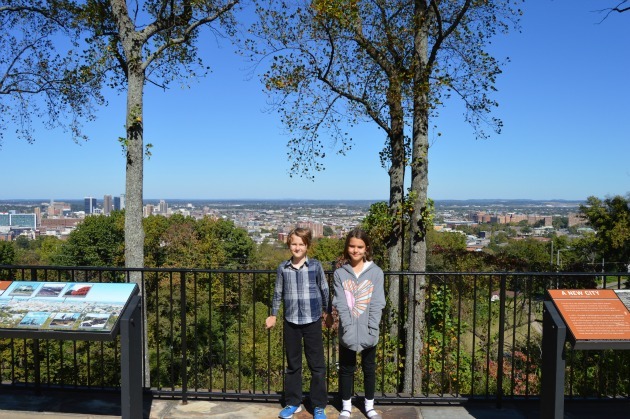 Next we had a quick stop at Vulcan Park to catch a great view of Birmingham before we left. It was a fun family weekend getaway! Travel is a joy when you feel confident in your plans. I hope you found my planning tips for fun family weekend getaways helpful. Where will you go on your family weekend getaway? If you are planning a longer trip, you may want to read 51 tips for how to travel with a family. My kids love staying in any hotel that has a pool for them. Holiday Inns work perfectly for us too! We have stayed in a couple of Holiday Inns over the years and we have always been very happy with them. My kids would be in the pool as much as possible. Seems like you had such a fun family getaway! I would love to take my family for a nice trip, a place with a pool is a must for us. I love going on getaway!! This looks like a great place to go with the family, looks like you squeezed in a lot in your getaway. It looks like you and your family had a great weekend. Those are some great tips! I especially agree with having some games or something for the kids to do during the car trip. These are all great tips, especially when you consider how stressful traveling with the family can be. I would love a nature inspired weekend getaway that involves unplugging. I absolutely love that you can borrow a fish while you stay there! That is awesome. My kids would absolutely love to have the temporary fish pet! The pool sounds so cool! An inside and outside pool that connect! We love Holiday Inn when we go away for little staycations. Looks like you had a nice little family getaway! I could definitely use a little weekend trip. We haven’t really done anything this summer and I’m going stir crazy. Now that the weather here in FL is starting to cool just a little bit, it’s a perfect time for us to plan something. There’s nothing like roadtrips for bonding with your kids. 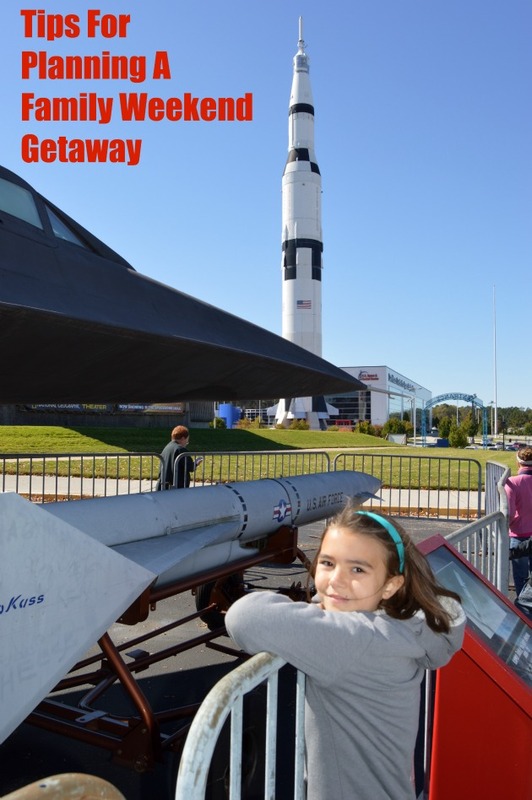 The rocket center in Huntsville looks especially fun and very educational for kids who are tomorrow’s scientists, doctors, engineers and astronauts. Those are great tips! Picking the right hotel can make or break the whole trip! Such a wonderful getaway this coming weekend, my wife and I were planning a family picnic this weekend. Such great tips! I have planned a trip to an attraction only to find it was closed. No beuno!